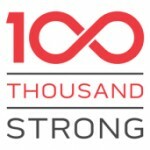 Each year, the 100,000 Strong Foundation selects approximately 100 students from around the country to serve as 100K Strong Student Ambassadors. By sharing their transformative China experiences with their peers and local communities, these Student Ambassadors play a vital role in furthering the Foundation’s mission of strengthening US-China relations through study abroad. Each year, the 100,000 Strong Foundation selects approximately 100 students from around the country to serve as 100K Strong Student Ambassadors. By sharing their transformative China experiences with their peers and local communities, these Student Ambassadors play a vital role in furthering the Foundation's mission of strengthening US-China relations through study abroad. 100K Strong Student Ambassadors represent the diversity of the United States and encourage students from underrepresented groups to study Mandarin and travel to China. The 100,000 Strong Foundation’s mission is to strengthen US-China relations through Mandarin language learning and study abroad. The Foundation is leading a national movement to ensure that the next generation of Americans is equipped to engage effectively with China.